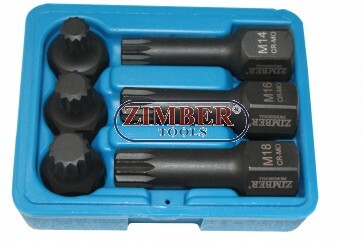 1/2" Impact Bit Sockets, Spline - ZR-06ISS12H2406, ZIMBER TOOLS. 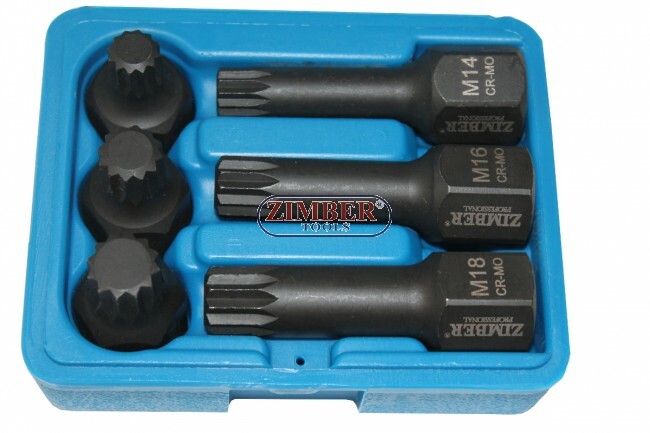 6pcs Impact Socket Set 1/2" - ZR-06ISS12H2406, ZIMBER TOOLS. Set of impact Spline bits in M14/M16/M18x 78mm and M14/M16/M18 x 43mm. Spline bolts are used on a variety of applications including VAG hub and calipers. Applications include M14 for VW LT/Transporter, M18 for Volkswagen Golf, M16 for Volkswagen Sharan. Spline Impact Socket Bit Set, 6PCS 1/2" DR. Manufactured from Chrome Molybdenum in black Phosphate finish. Sizes: M14 | M16 | M18 Each size in two lengths: 43mm/78mm. Essential for VAG hubs and calipers on LT, Transporter, Golf and Sharan. 4-piece Bit Socket Set for T-STAR, tamperproof, 1/2"
1/2"Dr. E32 Deep Socket (ZJ-S68HD4132) - JONNESWAY.